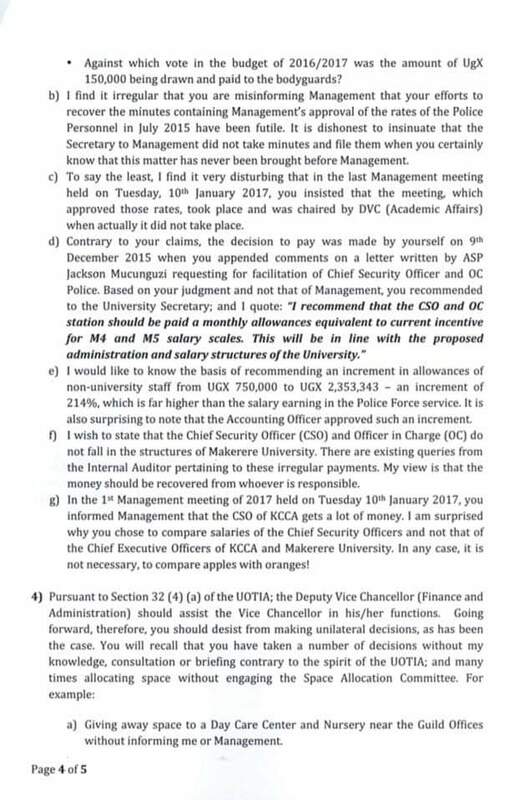 MAKERERE – As Makerere University Vice-Chancellor Prof Barnabas Nawangwe comes under public scrutiny for suspending the chairperson of the Academic Staff Association over alleged misconduct, it has emerged that he himself was pinned by his predecessor over insubordination and financial indiscipline. 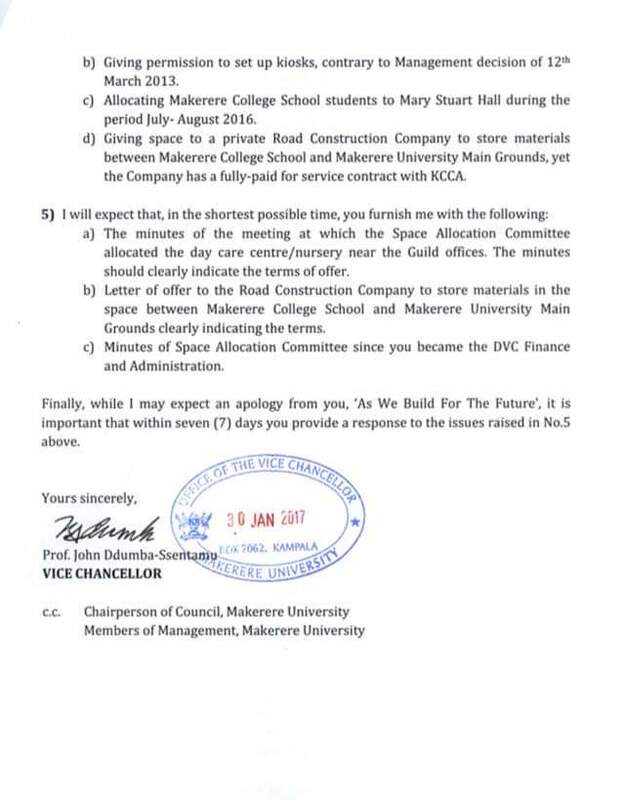 Makerere University Academic Staff have refused to return to work, protesting what they described as unfair suspension of their chairman, Dr. Deus Kamunyu Muhwezi. But now it has emerged that months before the end of his tenure, the former Makerere University Vice-Chancellor, Prof. Ddumba Ssentamu accused Prof. Nawangwe, who was then Deputy Vice Chancellor in charge of Administration, of making unilateral decisions and involving himself in acts of insubordination, gross misconduct, and disrespect. 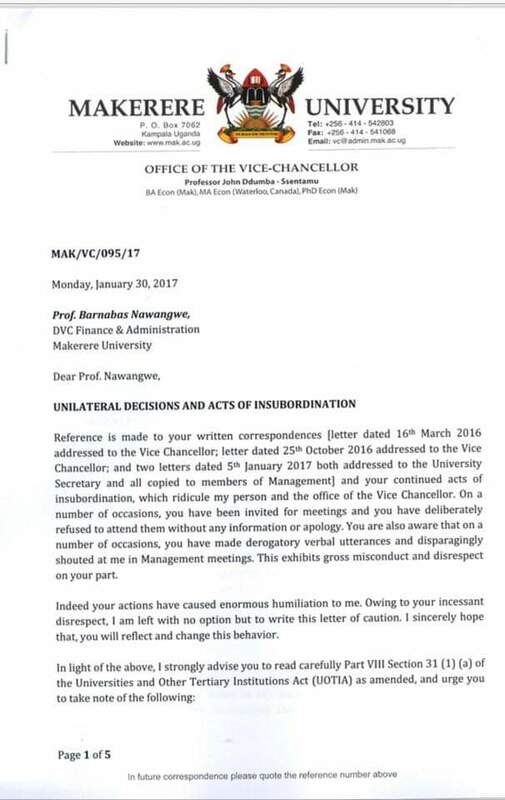 In a 6-page letter of caution, dated January 30, 2017, Prof. Ddumba observed that Nawangwe’s acts of insubordination had caused him enormous humiliation. “Your continued acts of insubordination ridicule my person and the person of the Vice Chancellor. On a number of occasions, you have been invited for meetings and you have deliberately refused to attend them without any information or apology,” Prof Ddumba wrote. Prof Ddumba also accused Nawangwe of making derogatory verbal utterances and disparagingly shouting at him during management meetings. Prof Ddumba further strongly advised Nawangwe to carefully read the Universities and Other Tertiary Institutions Act to acquaint himself with the hierarchy of the institution. 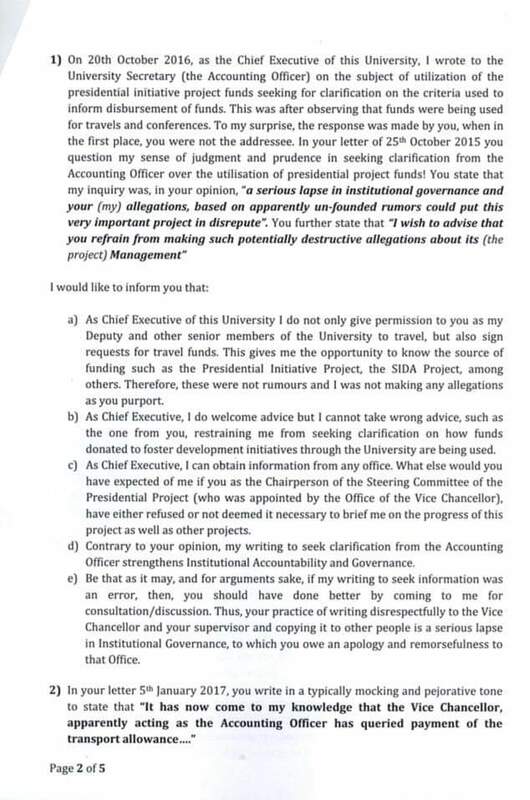 Although Nawangwe did not directly respond to the letter, he reported the matter to the then University Council Chairperson Eng Dr Charles Wana Etyem. In his report, Nawangwe stated that the arguments advanced by Ddumba were hearsay, defamatory and deficient in comprehension of the relevant law. Surprisingly Prof. Nawangwe quotes the same law and its legal provisions in suspending his subordinates. Kyambogo University Vice-Chancellor Prof Eli Katunguka, who for 34 years served at Makerere University in various positions including heading the institutions’ Research and Graduate Training Directorate, is quoted by Uganda Radio Network as saying that institutions must in their governing rules define what insubordination entails. 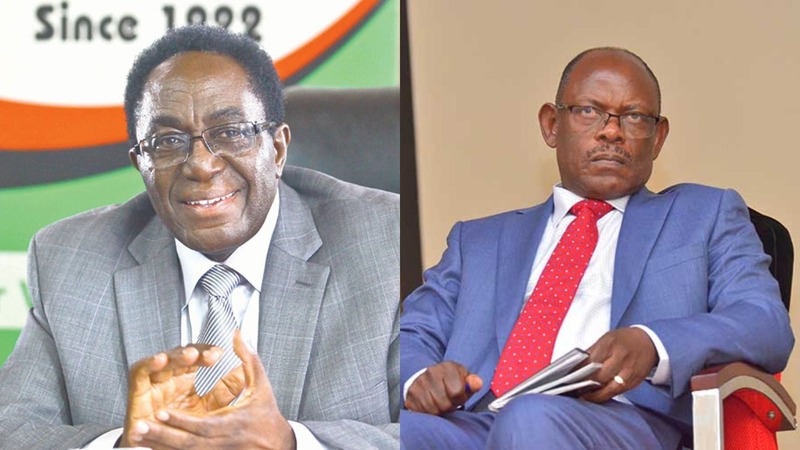 According to Prof. Katunguka, while the Vice-Chancellor may be the Chief Executive Officer – CEO of the institution, there is no legal provision for him to meddle into issues staff associations. 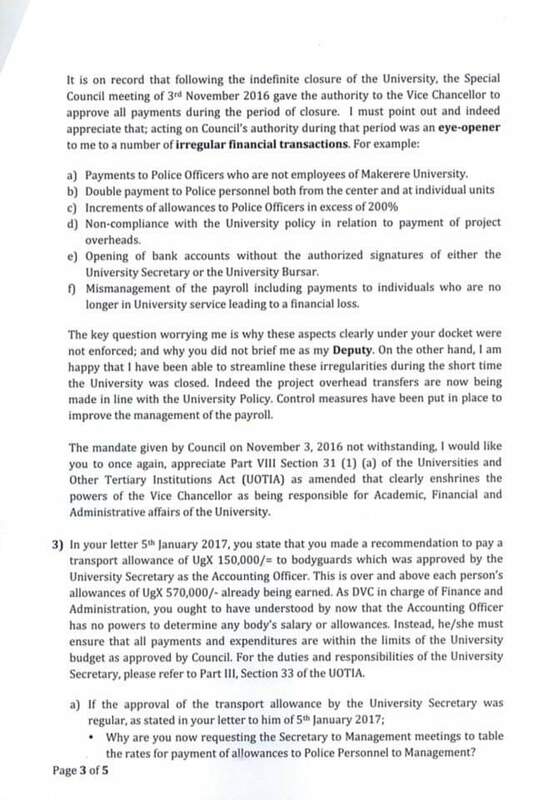 He says the CEO asserts his authority through structures and not poking his nose in every business of the university. “These are associations that bring together members of staff largely to engage management and council for better terms of service. I don’t see the role of the university administration like the Vice-Chancellor or the University Secretary for that matter in determining who should chair or represent staff anywhere,” he is quoted as saying by Uganda Radio Network. Katunguka adds that institutions are utilizing loopholes within the Universities and Other Tertiary Institutions Act which gives the Vice Chancellor overall powers but does not give guidelines on how those powers can be exercised. “The Vice-Chancellor should not be in a position to pick a quarrel with a kitchen attendant. The kitchen attendant should raise their issues through the warden, then to Dean of Students and finally to the VC,” Prof Katunguka states.